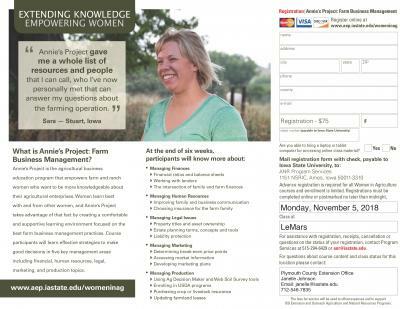 Iowa State University Extension and Outreach Women in Ag program is holding Annie's Project: Farm Business Management beginning Monday, November 12, 2018 in LeMars, Iowa and continuing Nov. 19, Nov. 26, Dec. 3, Dec. 10 and Dec. 17, 2018. Classes are 6:00 p.m. to 9:00 p.m. with a light meal served at 5:30 p.m. The classes will be held at Plymouth County Extension Office, 251 12th St. SE, LeMars, Iowa. Cost is $75. What is Annie’s Project: Farm Business Management? 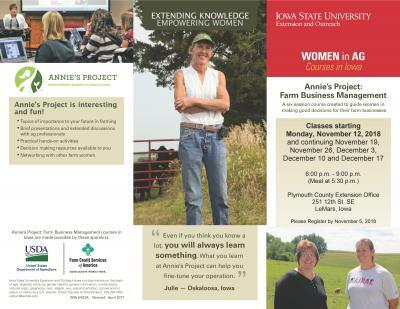 Annie’s Project is the agricultural business education program that empowers farm and ranch women who want to be more knowledgeable about their agricultural enterprises. Women learn best with and from other women, and Annie’s Project takes advantage of that fact by creating a comfortable and supportive learning environment focused on the best farm business management practices. Course participants will learn effective strategies to make good decisions in five key management areas including financial, human resources, legal, marketing, and production topics.